Every day games become more processor intensive. A device that six months prior may had enough RAM to play the latest games, may now be obsolete. Recognized Developer Juwe11 has come up with a solution to the problem. •Balance – Option which makes your RAM to the best optimization, this option is for everyday using when you use your phone for the most functions and you want have fast phone without lags. 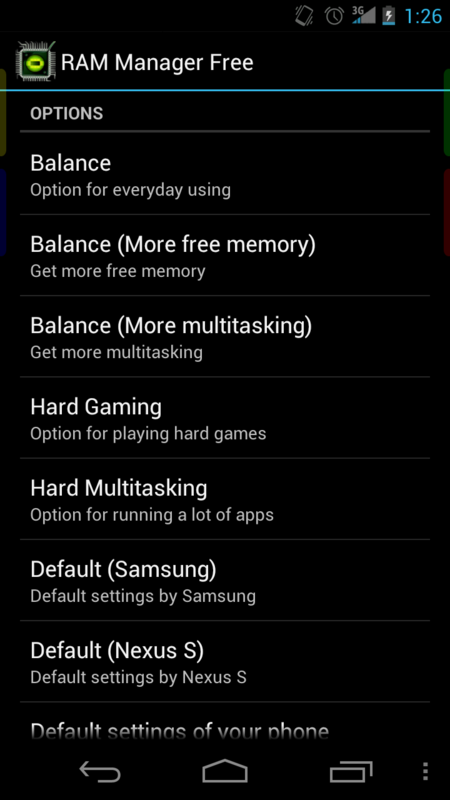 •Hard Gaming – Option which stabilizes your RAM for playing the hardest games. Use this option for games which lags on your phone. Your games will be smoothness and without lags. Play GTA 3 and other heavy games without lags. •Hard Multitasking – Option for users which are really hard working on their phones. You can have a lot of running apps with fast switching between them and without lags. •Default -This option reverts your RAM to your default settings, which you had before you install this app. For those of us who are gamers, this app is wonderful in that it keeps the phone optimized under even the most intensive games. So head on over to the thread here and game on.